The existence of unstable dismantling slopes affects the safety of the rail service, the road network, mountain populations, mining areas, etc. Periods of heavy rain can cause uncontrolled movements of the land, rockfalls or landslides with disastrous consequences of personal and material damage. It is estimated that the losses caused by this type of disaster amount to 220 million dollars a year, causing an average of 17 deaths per year. Globally, earth movements cause hundreds of billions of dollars in damages and hundreds of thousands of deaths and injuries every year. 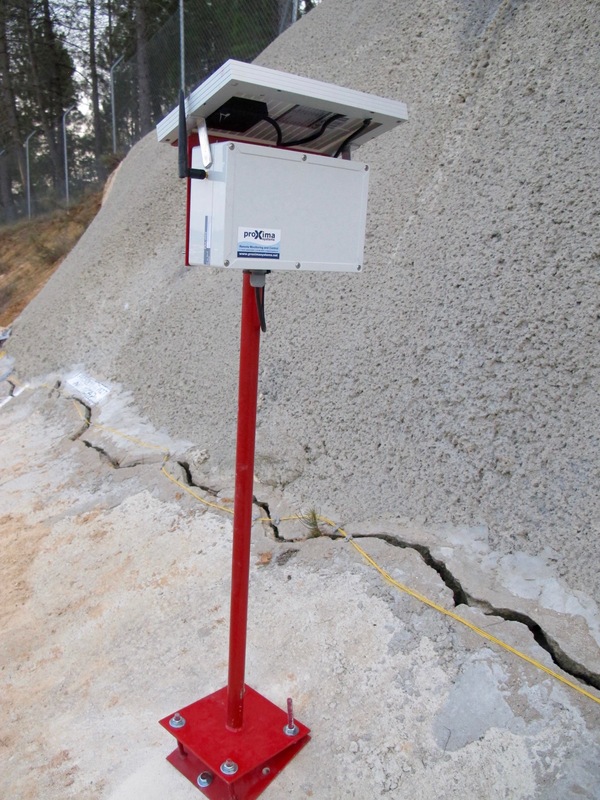 The slope monitoring tool is an intelligent monitoring system for the control of slope slope movements based on the data provided by a network of state-of-the-art sensors. The sensor network consists of small wireless devices, connected in a mesh network, capable of continuously monitoring, with high precision and in real time, the possible movements in the study area. This solution presents a control panel that shows the differential movements of the terrain, allowing to analyze its evolution and predict the precise moment in which to carry out maintenance tasks. On the other hand it also allows detecting the occurrence of landslides, notifying the event of a control center. With this system, an efficient use of resources is achieved, which favors a balanced economic growth and an improvement in competitiveness. Using the wireless sensor system PRS-WSS (Wireless Slope Sensor) is a high-precision system for the control of uncontrolled movements on clearing slopes. It is based on an intelligent monitoring system that favors the implementation of a pro-active maintenance with very low costs compared to the usual inspection systems. It is a non-invasive and low-cost system that provides technical results with an accuracy equal to or greater than the current ones, making it possible to detect unstable movements early. All information is presented in a dashboard for observation and follow-up. Reliable technical results with an accuracy equal to or greater than the current ones. Technology for the security of goods and people. In Spain - due to factors such as the rugged topography, the varied geology and climatic conditions - slope movements are of great importance, assuming the greatest economic losses caused by external geodynamic processes (without considering erosion and flooding),and causing risks, especially in urban areas and in communication routes. Monitoring of areas affected by natural disasters. IProx 3G controller equipped with a radio base station, which receives the measurements and alerts collected by the PRX-WSS sensors and transmits them to the IProx Cloud web application. Meteorological station for the measurement of meteorological variables. IProx Cloud web application that presents one or more dashboards with detailed information on the evolution of the slope over time. Accelerations in the three axes (horizontal, vertical and depth). Configurable scales from ± 2g to 16g. Instantaneous angular movement of the sensor (gyroscope): degrees / seconds. Configurable scale from ± 250dps to 2500dps. Position of the sensor relative to the magnetic pole (electronic compass). Configurable scale ± 2 Gauss to 16 Gauss. Weather station: temperature, humidity, wind direction, wind speed, precipitation intensity, accumulated precipitation. Wireless communications encrypted in free band. Mesh network Solar photovoltaic power. Controller: 220Vac supply (possibility of solar power), connection with the Internet via Ethernet or 3G. Line of direct vision with, at least, 2 sensors of which integrate the network. Sensors: direct line of sight with, at least, 2 other sensors of which integrate the network. Exposure to solar radiation. Display of control panels: device (computer, tablet, mobile phone) with updated web browser and internet access. In each implementation we can include the specific software for analysis and presentation of data required by the project and private client. Additionally, we can take charge of the previous study and characterization of the slope, as well as the installation and commissioning of the sensors and controllers in the area to be instrumented. Q: Is it possible to integrate the collected information with other applications? Yes, IProx Cloud has an API that allows both collecting and sending information to other systems. Q: Can other sensors be added to the values ​​collected and registered by the tool? Q: Is it possible to remotely view the live slope and the recordings corresponding to the detected events? Yes, one of the usual complements are fixed cameras that collect images of a view or motorized cameras that make rounds and record detail images of several zones from the same camera. Q: What is the delivery time of a monitoring project for a slope? It depends a lot on the scope of the project, needs for particularization, accessibility of the slope, etc. It is recommended to consult each specific case.